Jesus, King of All Nations said, "My daughter, I, in My great Mercy, through the mediation of My Immaculate Mother, come again to appeal to the world which has forgotten its God!!!" In response to His appeal, we spread Devotion to Jesus King of All Nations through Visitations of His Image to homes and churches. Jesus desires that His Image travel. He said, "This Image is a sign that I rule Heaven and earth, and My Kingdom, My reign, is near at hand. Give this Image to mankind as a source of graces and of peace…This Image, My child, must become known. Tremendous will be the miracles of grace that I will work through this Image and Devotion of Mine." 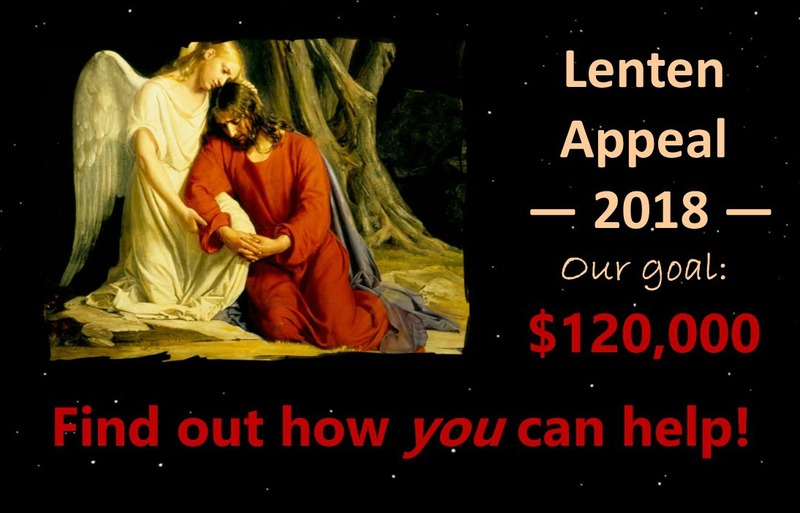 In order to continue our work for the greater glory of God, we must raise $120,000 by Good Friday if we are going to keep these Apostolates active! You can help us to promote and spread His Devotion and to bring His reign by hosting a Visitation of His Image in your home or church. Please click here to learn how. You can also enthrone His Image in your home for His protection. Please click here to learn how. Jesus said, "Enthrone this My image everywhere for I shall be powerfully present there and the Power of My Sovereign Kingship shall surely shield you from My Just Judgment. Be strong and do not lose hope. I AM with you to save you." In these perilous times of chastisements, such as natural disasters, mass murders, terrorism and annihilation of Christians, you should also read my book, Chastisements, Preparation and Protection Against Them. It contains all of the promises of protection and the devotional prayers that Jesus gave. Please click here to order it or call our center for more information. Save 20% by entering 20off in the Discount Box of your shopping cart. We truly need your help right now. Please be as generous as you can during this Lenten season as I beg alms from you with my left hand while imploring God's Providence with my right hand. Scripture tells us that "almsgiving covers a multitude of sins" (Sirach 3:29b). . . . It is better to give alms than to store up gold; for almsgiving saves one from death and expiates every sin. Those who regularly give alms shall enjoy a full life." (Tobit 12: 8-9). Please make your most generous donation online today. Thank you for your generosity. May Jesus King of All Nations help you to enjoy a full life, protect you and your loved ones and may you have a blessed and fruitful Lenten season. Don't forget, we remember you. Our benefactors receive the following spiritual benefits from our Apostolates: our intercession for your Prayer Petitions (click here to make your Prayer Petitions) in our daily Chaplets; in our Rosaries and perpetual Novenas; in our weekly Holy Hour before the Blessed Sacrament and in our special monthly Masses for your intentions. Thank you for your donation today!